As I looked up from leading the songs at VBS each day this week, I noticed something: The children were singing and watching me for the actions. The leaders were participating and building relationships with the children. The pastor was singing and smiling with the children. But there was a group who wasn’t being as reached: the parents lining up and watching in the back of the church. They were hearing the last song or so and seeing the passion of the full sanctuary praising God. However, I wished I could be in the narthex, touching base with parents as they walked in. Some of them were school or church families, but some were not. We often think about connecting the children with Jesus Christ, that they may come to church. But, who drives them? Being more intentional about connecting with parents could make a big impact on the church, making young parents, new church-goers, and those who are members already feel more tied in to the body of Christ. On our last VBS day, the director invited parents to join us for the entire closing. Parents had their own section of the church. We involved them by talking to them, encouraging them to sing, and letting them hear the meaning of the songs. The beautiful part was when Pastor said, “If you do not have a church or school home, we would love to have you come here and worship with us.” Our VBS director also said something similar. It was wonderful! A sweet, direct invitation shared kindly is a beautiful thing. A caring, welcoming invitation can be what someone needs to feel included. It is important this is done in a friendly, non-threatening way. In our VBS it was integrated in a loving tone from the the pastor and the director after joyfully singing together. Your invitation doesn't have to wait until the last day either! This invitation can be made more powerful by following the next two tips. As a part of volunteer training, we discuss how leaders are to interact with children, but rarely how to interact with their parents beyond check-in and signing out. Having volunteers add a component of welcoming and friendly greeting each time they see the parent could make a big impact. There are often workers who are not with a group of children at opening and closing. These volunteers could make it a point to say hello and chat with parents after their station is set up or cleaned up. These small, intentional moments communicate care and can leave a lasting impression. 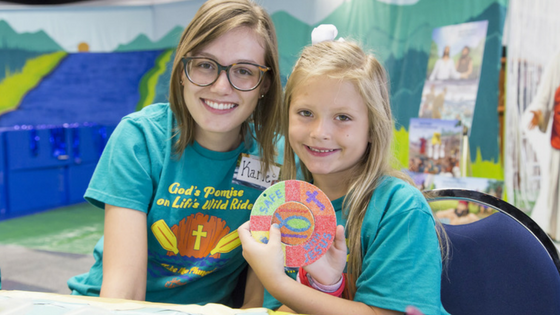 The VBS director materials contain a CD that has take-home sheets to send with the parents. Each day’s lesson is broken into Bible text and discussion points for the parents. They are quick reads for a parent on the go. These could be printed and given daily, or, they could be copied or attached to an e-mail message. Using tools such as these saves you time and can make a connection with parents. The parents feel in the loop and equipped to discuss stories with their children. Also, parents could need to hear these words of God’s promise anew for themselves. Often, words spoken with child-directed simplicity can really get into an adult’s heart. Parents are the most important people in their child’s faith life. How are we taking advantage of the times we see them? I don’t think it needs to be much. It could be those short, intentional moments to communicate care and belonging that make a lasting impression. I challenge you (and myself) to not let those moments slip by. Take advantage of the materials CPH supplies with your curriculum. Personally invite them to join the church in worship. Reach out and give your interactions to God. The Splash Canyon Director Guide includes loads of digital content, including daily take-home letters that you can print and distribute to parents. Learn more about the guide by clicking the link below. 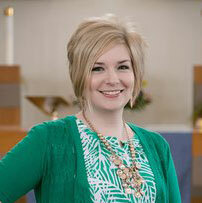 Beth Schultz is a preschool teacher at Bethany Lutheran Church and School in Naperville, Illinois. Since beginning teaching in 2012, she has loved working with all age groups: in middle school and youth group theater, primary grades teaching or VBS sessions, and preschool activities. She loves sharing different experiences with her students to expand their knowledge (like keeping reptiles in the classroom). Most of all, she is blessed to share the message of Christ with children and their families every single day through school and her opportunities to write through CPH.